Diwali is a five day Hindu festival also known as the festival of lights. It Starts with Dhanteras first day then Choti Diwali next day then Diwali then Govardhan Puja and on the last day Bhai Duj. 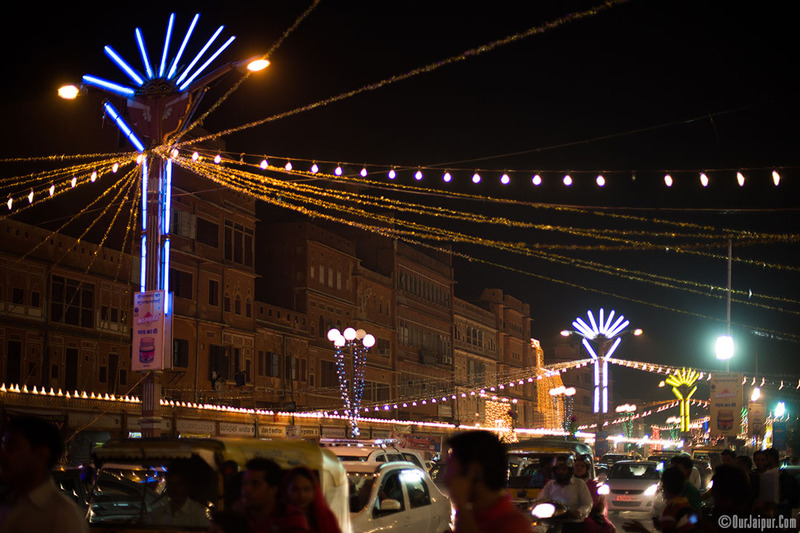 Diwali of Jaipur is world renowned for the way it is celebrated in Jaipur and for the Lights decoration done all around the city. Diwali is arrived from word Deepawali which means Row of Lamps (Deepak) people also call it Deepavali or Divali. Diwali is celebrated on Krishna Chaturdashi generally falls between Mid October to Mid November. 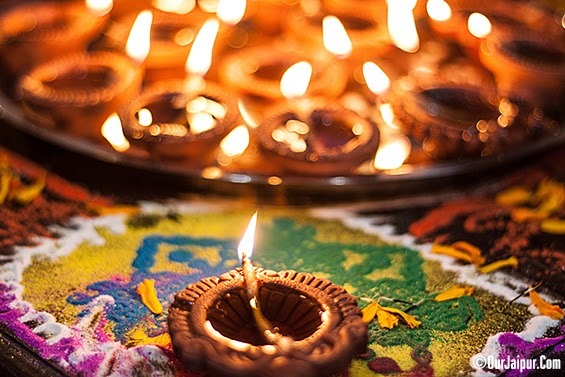 Diwali is an official holiday in India, Nepal, Sri Lanka, Myanmar, Mauritius, Guyana, Trinidad & Tobago, Suriname, Malaysia, Singapore, Fiji and few more Countries. Diwali symbolises the victory of good over evil. Dates of 2014 Diwali Festival are from 21 Oct to 25th Oct. 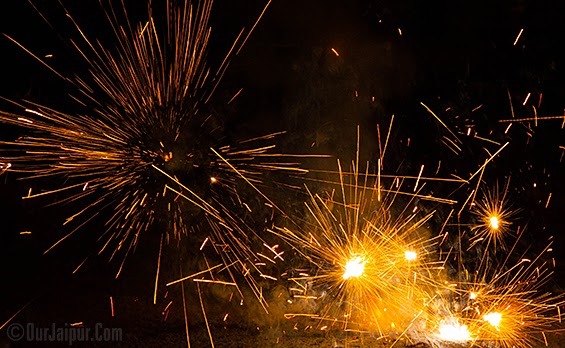 Dates of 2015 Diwali Festival are from 9 Nov to 13 Nov. Dates of 2016 Diwali Festival are from 28 Oct to 1 Nov.
Diwali is the Biggest Festival for Hindus, Celebrated with great passion and delight in all over the World. Preparation of Diwali Celebration starts many days before the Diwali, it’s a ritual to Clean up your Home and Workplace, give away the old and useless things to needy, in order to make Goddess Lakshmi feel Welcomed to bring Prosperity and Happiness to you. Diwali is the five day Festival and the third day is the Main Day when Goddess Lakshmi is worshiped which is known as Lakshmi Puja. In process to welcome Goddess Lakshmi people Decorate their Home and Workplace with Lights, Rangolis, Light Clay Lamps (Diyas) filled with oil and other decorative stuff. This is the reason why Diwali is known as the Festival of Lights. People also burst Fire Crackers to drive away the Evil Spirits. People wear new clothes, Exchange Gifts and at home Mom Makes Sweets and yummy Dishes. There are Many stories and reasons why Diwali is celebrated all around the Country but one of the most common is that it is celebrated because Lord Ram returned to his kingdom Ayodhya after the 14 years of exile in forest, Tau Bolo Sia Pati Ram Chandar Ki Jai! ! ! Basically Diwali is the time when harvest season ends, so at this time Farmers thank the Gods and pray for the Good harvest next year. Traditionally this is marked as the end of year as per Agricultural Cycle so traditionally New year Starts with Diwalli. Dhanteras Is the First day of Five day Diwali Celebration. On Dhanteras Hindus find it Auspicious to buy Gold or Silver or at least some utensils. Lakshmi Puja is Performed in the evening and Small Lamps (Diyas) of clay are lighted and the Celebration of Diwalli Starts. One of the Popular Legend of Dhanteras is that, Son of King Hima was Predicted to Die on the fourth day of his Marriage by Snake Bite as per his horoscope. So on the fourth night his Wife did not allowed him to nap and she Lighted many lamps everywhere around the palace and surrounded her husband’s Chamber with huge heap of Gold and silver ornaments and She started dancing and Singing Songs. When Yama (The God of Death) came in appearance of Snake his eyes got dazzled by the shine of gold and silver, he was not been able to cross that heap so he sat on the heap and got lost in the Singing and Dancing of the Queen and in the morning he went away. So young wife saved her Husband by Lighting the lamps and with the help of Gold and Silver. . “Tau Bolo Sia Pati Ram Chandar Ki Jai”! ! ! Choti Diwali (Small Diwali) as the name recommend is Divali on a Small Scale, is celebrated on the Second day of Five day Deepawali Festival. The Popular Legend of Choti Diwali (Small Diwali) is that upon this day Satyabhama killed “Narakasura” with the help of Krishna because Narakasura took away Very nice Earrings of Aditi the Mother Goddess and Kidnapped 16000 daughters of Gods. After killing Narakasura Krishna Married all those 16000 women and “Aditi” even Got her Earrings back. Bhudevi The Mother of Narakasura declared that the death of his Son should not be the day of grief but an Occasion to celebrate since then Choti Diwali is celebrated. “Tau Bolo Sia Pati Ram Chandar Ki Jai”! ! ! Diwali is upon the Third day and this is the main day and Peak of the festival. As per the Legend this is the day when Lord Ram returned to his kingdom Ayodhya after the 14 years of exile in forest. So from that day this day is celebrated as Deepawali. Tau Bolo Sia Pati Ram Chandar Ki Jai! ! ! Govardhan Puja is celebrated on forth day on this day North Indians Worship Govardhan which is a small hill near Mathura. Once upon a time to save all the Villagers from Heavy Rainfall lord Krishna lifted this hill on his little Finger. So Govardhan has been Worshiped, basically this day is also known as Rama - Shyma day. Generally this day is used for Socialising, people go to each other houses and Wish then for happy and prospers future. 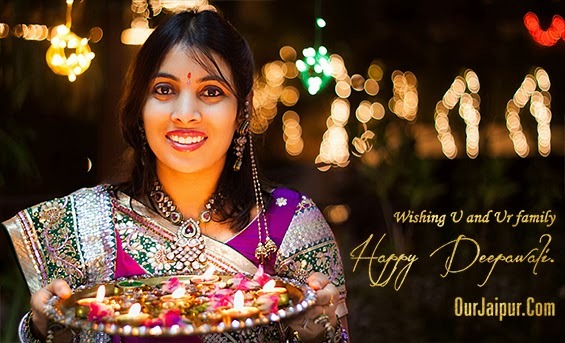 Bhai Dooj is the Last day of Diwali five day celebration. On this day sisters put Tilak on the forehead of her brother and pray for his long life, in return brother give her gift as token of love and they share food. The story is that after long time Yamaraj (The God of Death) went to his sisters house Yami. After seeing her brother after long time Yami got very happy she put Tilak on the Forehead of Yam and they shared food. After seeing so much Love Yam also got happy and said that whoever is going to do the same as they did on this day then the Brother will get Long life. So for the Long life of Brothers this day is Celebrated. Diwali in Jaipur is Highly Recomended. 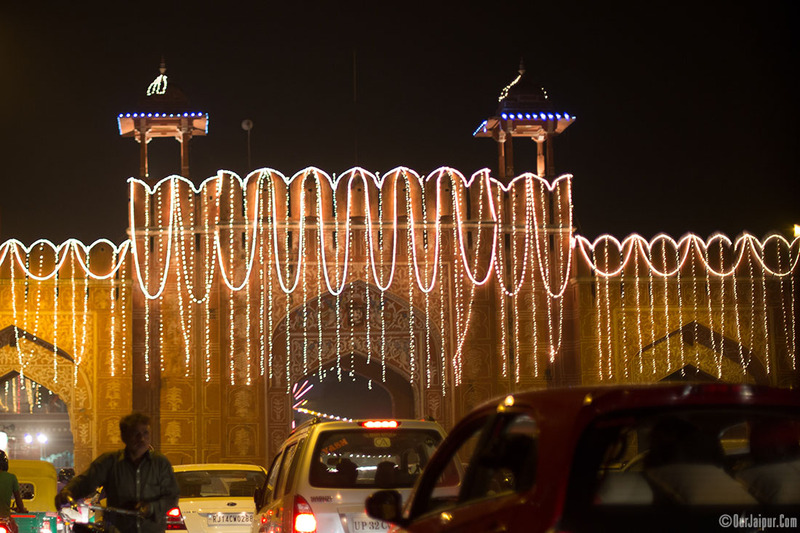 Glimpses of 2014 Deepawali from Jaipur India. Happy Diwali or Deepawali from Jaipur. 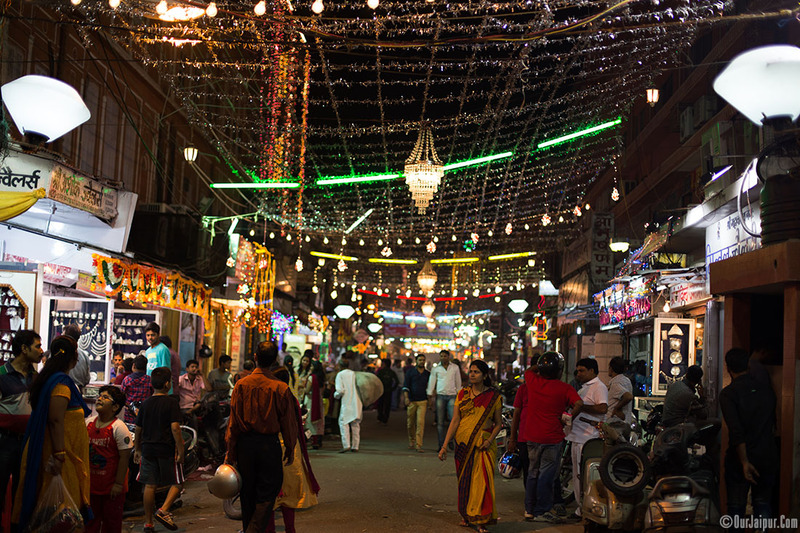 Diwali at Johari Bazar Jaipur. Ghee Walo ka Rasta, Jaipur on Deepawali Night. Haldiyon ka Rasta, Jaipur at Diwali Night. Jaguar Celebrating Deepawali in Jaipur. Some Light at Johari Bazar on Diwali Night. 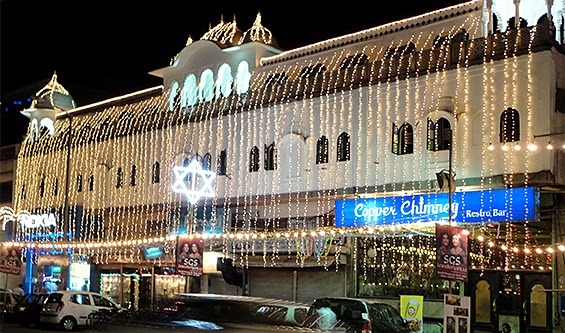 Lmb or Lakshmi Misthan Bhandar Diwali Decoration Jaipur. Mercedes Benz Celebrating Deepawali in Jaipur. 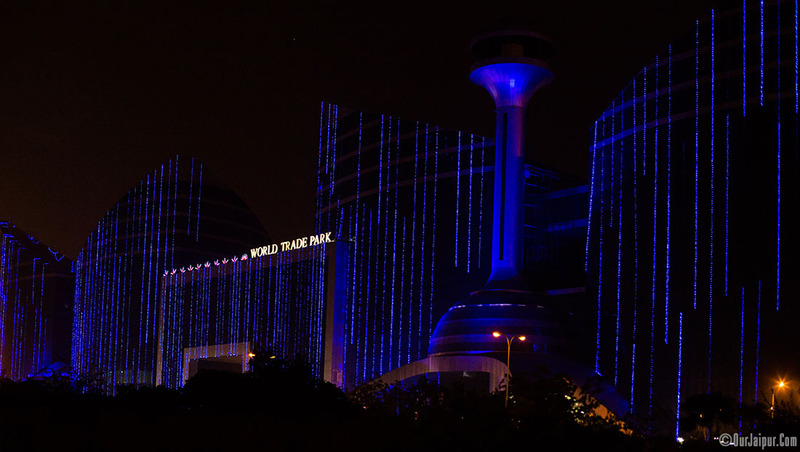 World Trade Park, Jaipur Diwali Time Decoration. Diwali Decoration at Birla Temple, Jaipur. 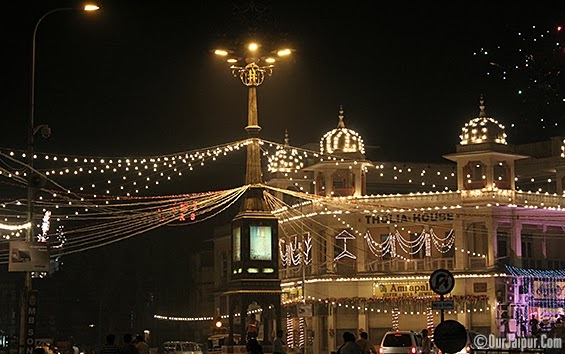 Decorated JalMahal on Deepawali Night Jaipur. 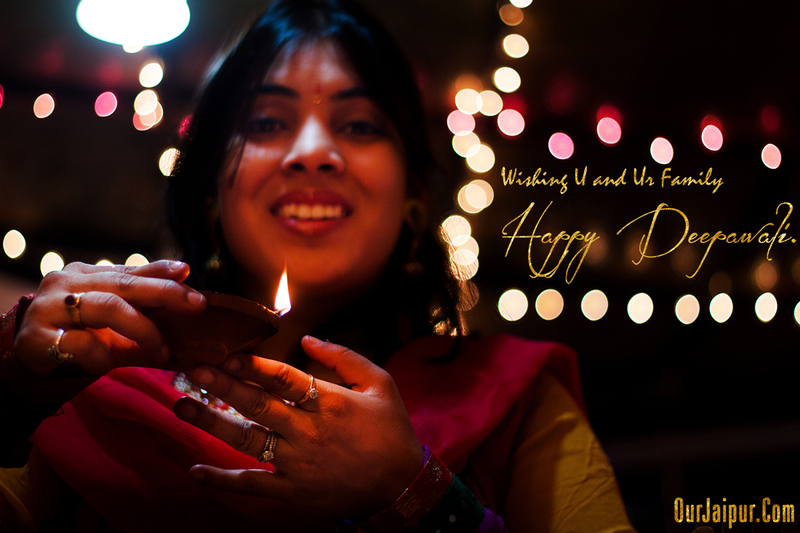 Glimpses of 2013 Deepawali from Jaipur India. 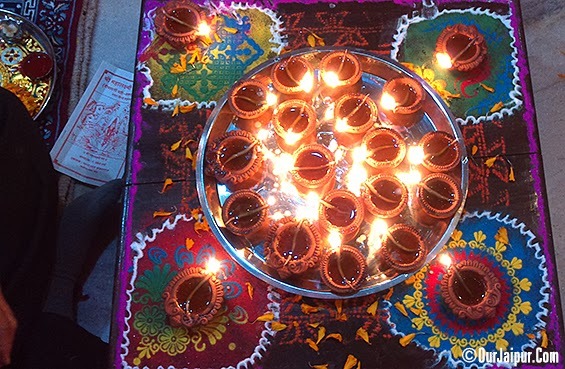 Diyas (Small Clay Lamps) kept on the Small Stool decorated with rangoli. Musicians Playing in the Hustle and Bustle of Jaipur Market. Hawkers selling Decorative things and Idols of Gods. 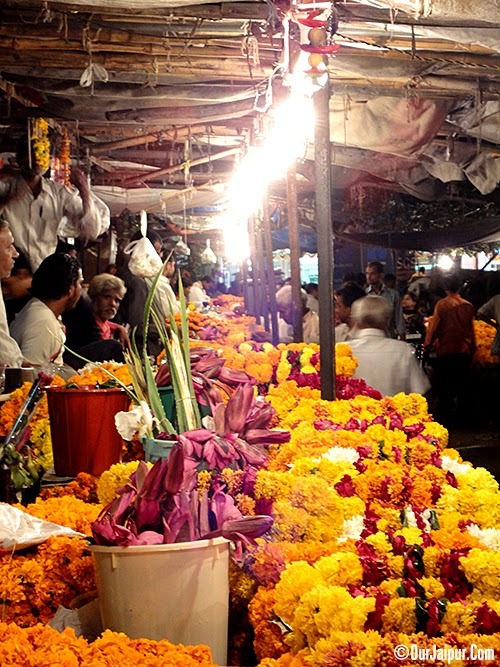 Flower Shops open till late in Night. 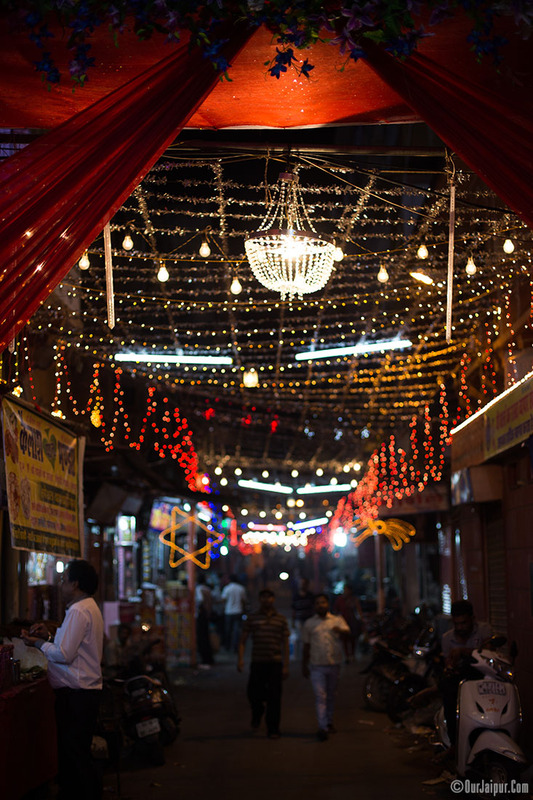 Decoration and night Market in Jaipur City. Decoration at Panch Batti, M.I. Road. Decoration At Tripolia Gate, Jaipur City. So many concept this celebration has to give to the needed for prperity. Lighting lamp to protect husband. Its a unique celebration I learn so much about 5hanks. Looking forward to the festival here. This is another brilliant post coming from you! Diwali seems to be celebrated with so much life in Jaipur. I am now eager to visit, though I have been to Udaipur. But it all seems so much beautiful in this city! Happy Diwali in advance. I have never had an opportunity to be in the North for Diwali. I think its a must to be seeing your pics. SO colorful and wonderful post. Happy Diwali to you in advance. Looks like an amazing and super amusing festival. All the lights are outstanding! 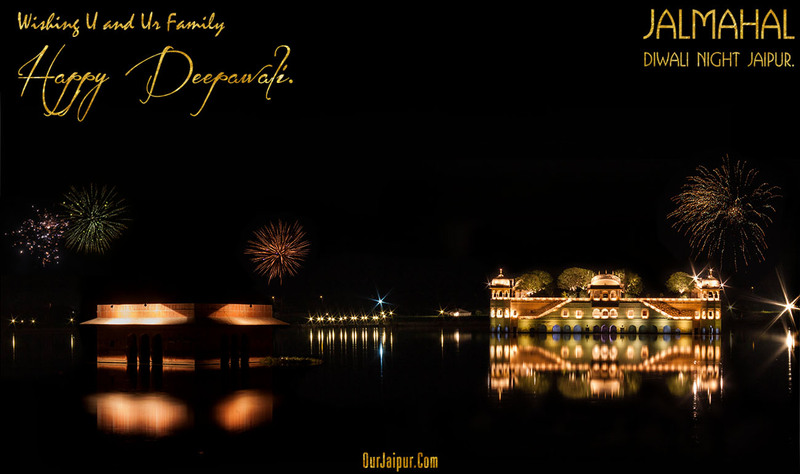 Yes I have experienced Diwali in Rajasthan, Its a life time experience to be there ! Wowww.. the lights and the colors are extraordinary!! seems like a worth while festival!! Interesting celebration! What so ideal decoration, and lighting! 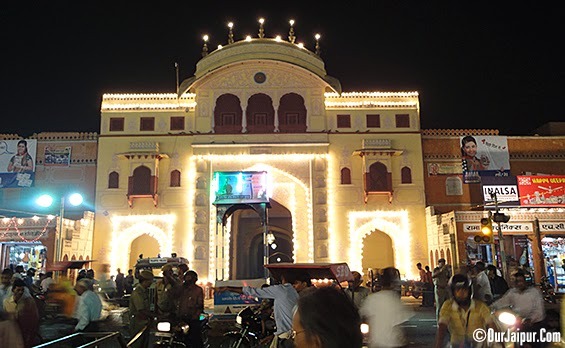 While Deepawali is celebrated in wide scale over here among the Indian, it doesn't come close to what you have share about the celebration in Jaipur. I am loving how it's welcomed in Jaipur with so much of fun, happiness and food. I am in the verge of going over to Jaipur in January and I am sure I am gonna have a great time. It would be a dream to join this celebrations one day! Amazing information! Thank you for the post and the photos! +1 by me! Great festival!! and beautiful photos!!! Beautiful decorations. Wish you happy deepavali. I didn't know about this very important festival, I'm glad you described it thouroughly. I like the habit if cleaning up and turn on the lights to welcome Lakhshmi, and the celebrating the end of harvest season. I love your culture and its traditions, you're doing a great job with your blog! wonderful photos, looks like a great time and festival! Thank you so much for sharing all the images of jaipur diwali..loved them! Your pics are always nice !!! Am already in the festive spirit !! I love it when somebody captures the vibe of a place and you guys do it right every time . Kudos! Wow, what the decorated market!! Love it.. Deepawali & Holi are my favorite festival..
WOW! What a wonderful festival! So pretty. I sure learned a lot from this post. Oh really pretty and interesting. I love it learn about new cultures. Btw G+ to your post! this is such a lovely post dear! I am so liking your images here in this post. Already excited to see your future posts. I love so much indian culture! Too bad here in Brazil we dont have this festival.. Wish I was in India!! 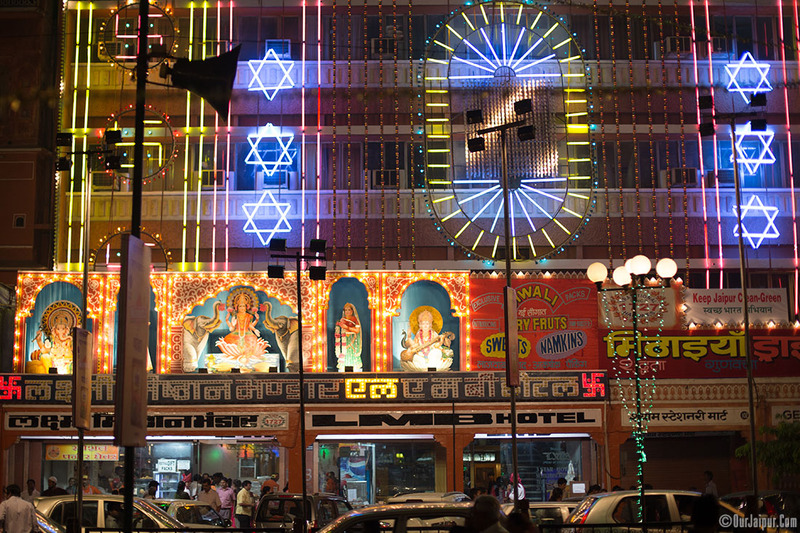 Diwali and Jaipur... they are closely linked. You have perfectly captured the photos and amazingly described the facts. My memory is getting refreshed !!! Wish you all a happy and safe diwali... and yes, say no to crackers! !